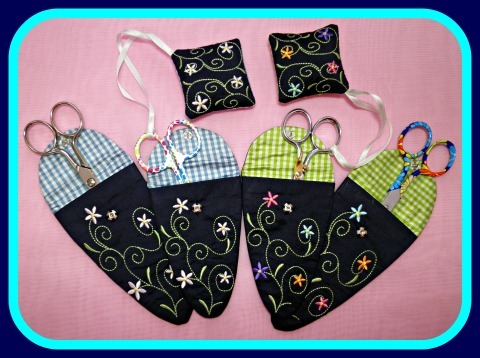 In this scissor case set, you will have a scissor case that will fit a 4” and 5” pair of scissors. Full color step by step instructions are included in a pdf file. Made completely in the embroidery hoop, the scissor cases fit in a 5" x 7" hoop and the scissor fob fits in the 4" x 4" hoop. The designs come in 8 embroidery formats: ART V2, DST, EXP, HUS, JEF, PES, VIP, VP3. Each format is placed in a folder so you can easily delete the formats you don't need. mb_sm_floral_sc_back - 95.3 mm x 159.7 mm OR 3 11/16" x 6 3/16"
mb_sm_floral_sc_front - 87.4 mm x 123.2 mm OR 3 3/8" x 4 13/16"
mb_md_floral_sc_back - 112.1 mm x 174.4 mm OR 4 3/8" x 6 13/16"
mb_md_floral_sc_front - 87.4 mm x 145.8 mm OR 3 3/8" x 5 11/16"
Please make sure the designs will fit in your hoop before purchasing. If you are looking to purchase the large scissor set, click here. If you are looking to purchase all sizes in a special set, click here.